King Willem-Alexander and Queen Maxima of the Netherlands are currently in Tokyo on a state visit to Emperor Akihito and Empress Michiko of Japan. On Wednesday, the royal couple were welcomed to the Imperial Palace. Everybody dressed just about the way you would expect them to: suits on the monarchs, tiny saucer hat and pearls on Michiko, and an orange dress with a turban-y headpiece for Max. She's also wearing diamond pendant earrings with citrine drops, a golden bracelet, and a watch. October babies, let's face it: you've got a pretty cool birthstone. Opals come in a variety of colors, and often they look like they're literally glowing from within. Most of the world's opals are mined in Australia, so it's no surprise that it's also the country's national gemstone. Royals have been attracted to opals for centuries, from the "Burning of Troy" opal given by Napoleon to Josephine all the way to the present day, though many royal collections lack major opal pieces. 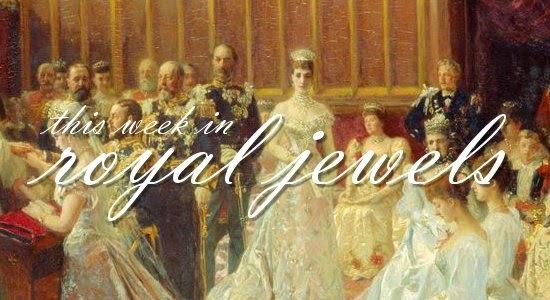 Today, we're running down ten of the most intriguing opals in royal collections past and present. 10. Queen Letizia's Pink Opal Earrings: Letizia's jewelry collection includes the "Dinah" pink opal earrings from Tous, a Barcelona-based jewelry company. (See a closer image of the earrings here.) The new Spanish queen prefers extremely delicate, minimalist jewelry, so these drop earrings are actually some of the more substantial in her jewelry box. The earrings retail for $540 and can be purchased here. Lots of the fantastic jewelry from the collection of our Magpie of the Month, Queen Ena, is well known, especially the pieces that various family members inherited and continue to wear today. But today, we're talking about her small cache of turquoise jewelry -- pieces that have managed to fall off the radar entirely in the years since Ena wore them. When Ena married the Spanish king in 1906, her uncle and aunt -- King Edward VII and Queen Alexandra -- were on the throne in Britain. The illustrated list of Ena's wedding gifts includes a present attributed to them: a turquoise necklace and earrings. (It's number ten on the list, which you can see here.) Above, Ena wears the turquoise necklace and earrings with a striking turquoise tiara. It's commonly called a turquoise "star tiara," because the top row of the piece features small stars above the central turquoise buttons. Can you identify the jewels worn in this 1920s-era portrait by Princess Marie-José of Belgium, briefly Queen of Italy? When it comes to royal biography, I appreciate a thoroughly-researched historical look at a royal's life as much as anyone. But my real favorite kind of royal biography is the insider account: the descriptions of the daily lives of royals from those closest to them. Gossipy, yes -- sometimes a bit unreliable, yes -- but always incredibly interesting. 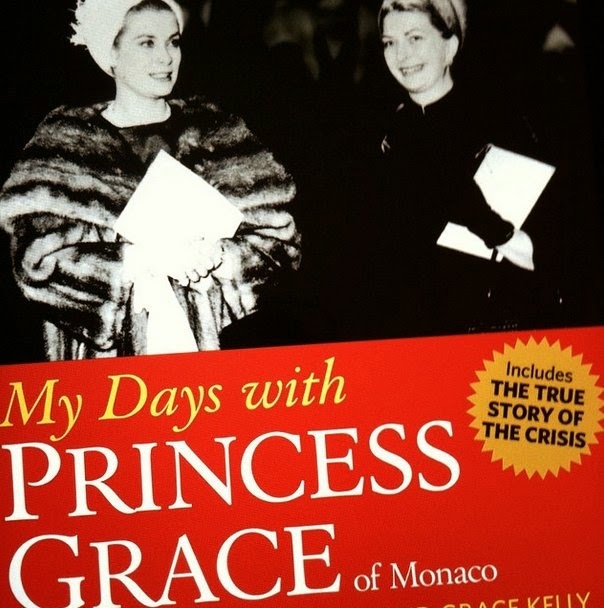 Today's book, My Days with Princess Grace of Monaco, is just one of those tomes. The book is a collection of memories of Joan Dale, one of Grace's closest friends from her years as a princess. Dale and her husband met the Grimaldis in the early 1960s, during the early years of their marriage. The Dales were living in France, where her husband was working with the American diplomatic corps, and the couples became close. Their children were of similar ages, and Dale suggests that Grace felt somewhat isolated in Monaco and was happy to find an American friend nearby. The Singapore state visit turned up the glitter last night with a state banquet at Buckingham Palace. The Queen and the Duke of Edinburgh hosted, and the guest list also included the Duke of York, the Earl and Countess of Wessex, the Duke and Duchess of Gloucester, the Duke of Kent, Princess Alexandra, and Prince and Princess Michael of Kent. As per usual at British state visits, the only royal who posed for photographs was the Queen. 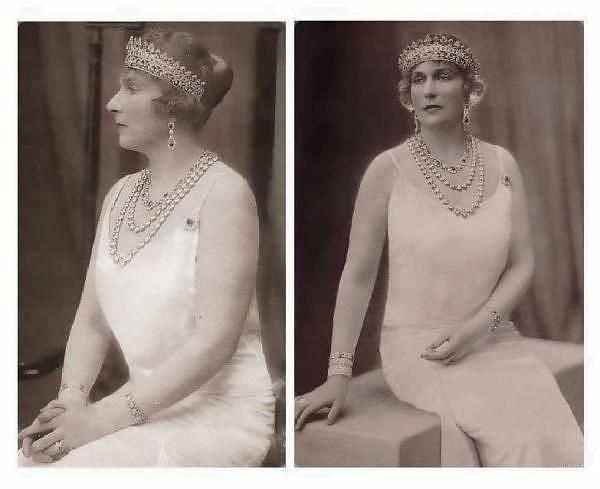 She wore the Girls of Great Britain and Ireland Tiara, the Coronation Necklace and Earrings, and diamond bracelets. The order she wears is Singapore's Order of Temasek, which she received in 1972; she's secured the sash with Queen Mary's Dorset Bow Brooch. She's also wearing the family orders of George V and George VI. While watching a video about George VI and Queen Elizabeth, I was riveted by a tiara on the Queen Mother that I believe I have never seen before! Could you give help identifying it? Can you identify the jewels worn here by Princess Caroline of Monaco at the 50th birthday celebrations for King Carl XVI Gustaf of Sweden in 1996? At the state banquet in Norway this week, Crown Princess Mette-Marit wore a tiara that has been her signature piece of jewelry since her wedding day more than a decade ago: a delicate bandeau tiara featuring daisy designs studded with diamonds. 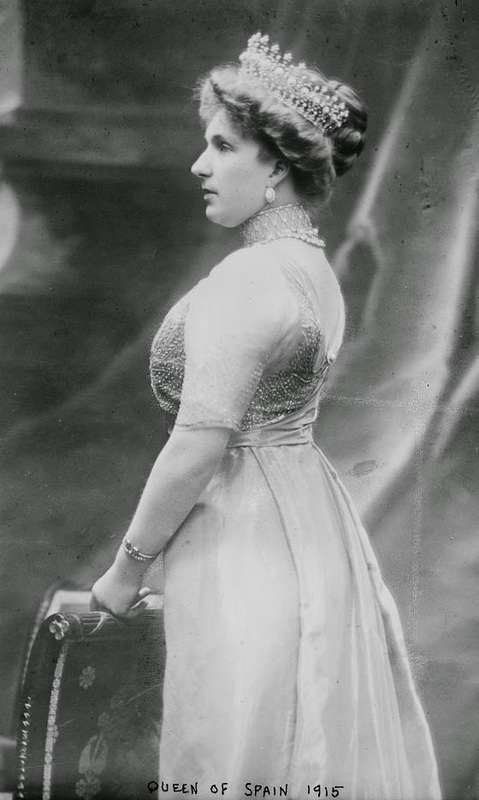 One of the most timeless and elegant of all of Queen Elizabeth II's tiaras is the diamond kokoshnik that belonged to her great-grandmother, Queen Alexandra. Today, we're tracking the history of this sparkler, which started off as a controversial present and ended up as a state banquet staple. 1888: The Prince and Princess of Wales, later King Edward VII and Queen Alexandra, celebrate their silver wedding anniversary. A group of aristocratic women, calling themselves the "Ladies of Society," decide to give the princess a tiara to mark the occasion. 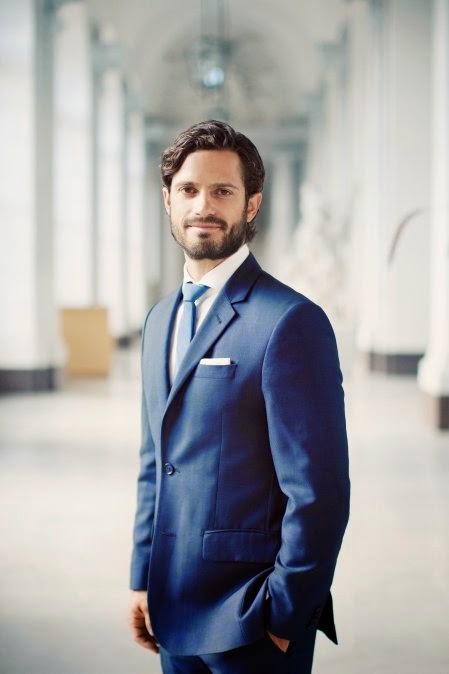 Although there are squabbles among the committee, they raise the necessary funding and commission Garrard to make the piece. 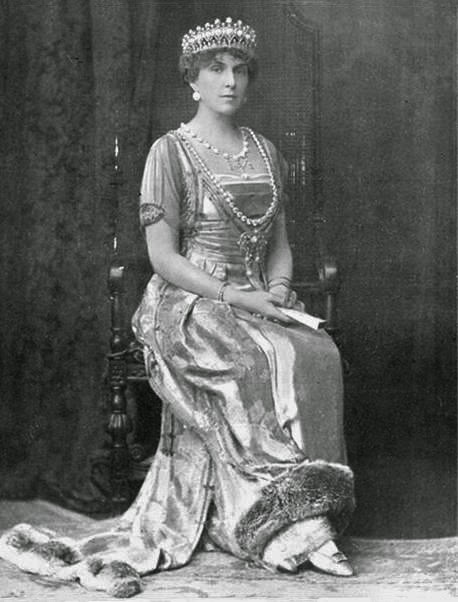 Alexandra requests that it be made in the style of a Russian kokoshnik tiara worn by her sister, Empress Marie Feodorovna of Russia (pictured above), and Garrard creates a diamond fringe tiara, set in white and yellow gold, that mimics the halo shape of the traditional Russian kokoshnik. 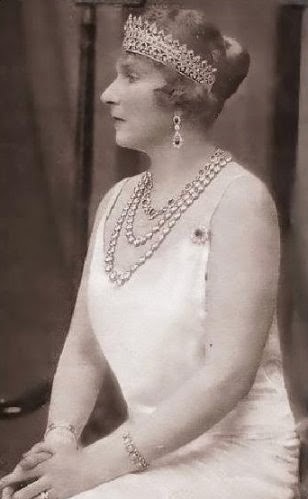 Maria, Lady Ailesbury presents the tiara, which could also be worn as a necklace, to the princess. 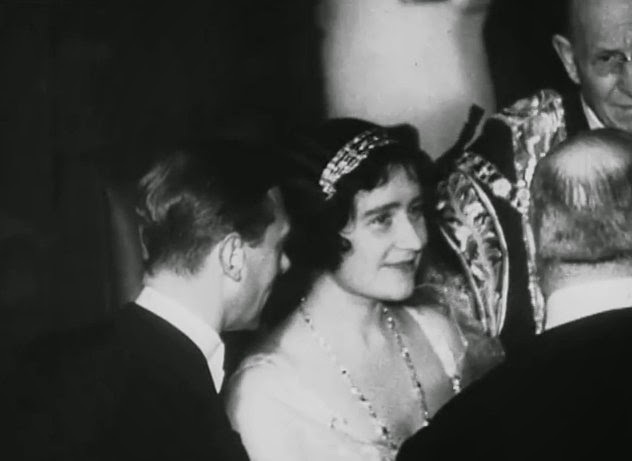 Can you identify the jewels worn here by Princess Marina, Duchess of Kent and Queen Mary on a trip to the theater in Leicester Square in December 1935? One of the more useful terms for you to have in your royal jewelry vocabulary arsenal is "Frankentiara" -- a rather colorful way of referring to a sparkler that is cobbled together from parts of other pieces of jewelry. Today, we're looking at one of the Frankentiaras that graced the head of a royal bride: Máxima Zorreguieta Cerruti, now Queen Máxima of the Netherlands. The base of this starry sparkler comes from another Dutch royal treasure: the Pearl Button Tiara. There’s a debate about the actual age of the base: some think that it was made in the twentieth century, while others argue that it was a part of a coronet worn by Queen Sophie of the Netherlands, which would make it an earlier creation. 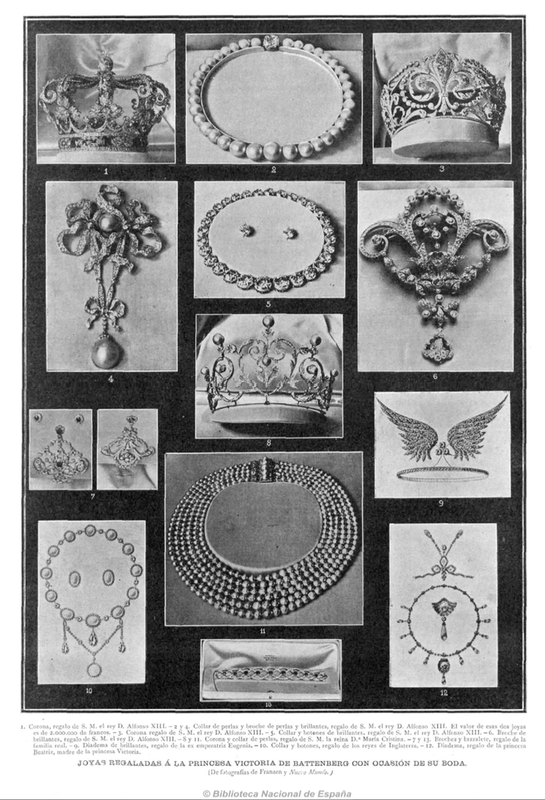 Lots of tiaras start off as wedding presents to royals from family members, wealthy patrons, and organizations. Often those presents are cherished treasures, in part because of their associations with their gifters. But that's not always the case. Today, we're looking at a tiara that actually started off in a very different form -- and as one of the wedding gifts presented to our Magpie of the Month, Queen Ena of Spain. Can you identify the jewels worn by Queen Marie of Romania, born Princess Marie of Edinburgh, in a portrait from 1918? It's hard to find a more collectively glamorous group of royal women than the ladies of the Jordanian royal family. Today’s tiara, the Cartier tiara that belonged to the late Queen Alia, has been worn by three of the country’s queens and princesses. Alia Baha Ad-Din Touqan was the third of the four wives of King Hussein of Jordan. (The first was Princess Dina; the second, Princess Muna, is the mother of the current king, Abdullah II; and the fourth is the American-born Queen Noor.) Alia was the daughter of a Jordanian diplomat and had lived and studied all over the world before marrying King Hussein in 1972.